Sam Haze reports for WHAM TV and begins with how CyberFace is being released from police custody. Dragon is interviewed regarding this act and although he does not ordinarily believe it to be a good idea to let known felons go free, he does believe that it was worth allowing CyberFace to go in return for bringing down OverLord. Frank Darling is interviewed next, justifying the trade made that enabled the Chicago Police Department to bring down OverLord. It is believed that the Vicious Circle will now crumble without a leader and he hopes that CyberFace uses his newfound freedom wisely. The report continues with a piece on how the Whelan-Freas Research Center mysteriously collapsed during a ceremony to celebrate its opening. Although no injuries have been reported, the police are still concerned as a possible related incident involving a creature identified as Complete Carnage destroying a bridge in Chicago after emerging for the first time in a of couple years. Rapture completes the preparation of her new water bed and cannot wait for Dragon to finally move in so that they can try out the bed together. Horridus is fascinated by the bed and attempts to feel it but is warned off by Rapture before the spikes of her skin burst it. Rosa Fua reports on the funeral held for OverLord which had a major police presence but there were few people to even attend. Former Mafia associates such as Roberto Giradelli and former friends of Antonio Seghetti’s speak on OverLord’s passing. His death has caused public opinion to change regarding Dragon since his rampage whilst possession. It seems that all has been forgiven regarding the death and destruction he unwittingly caused. 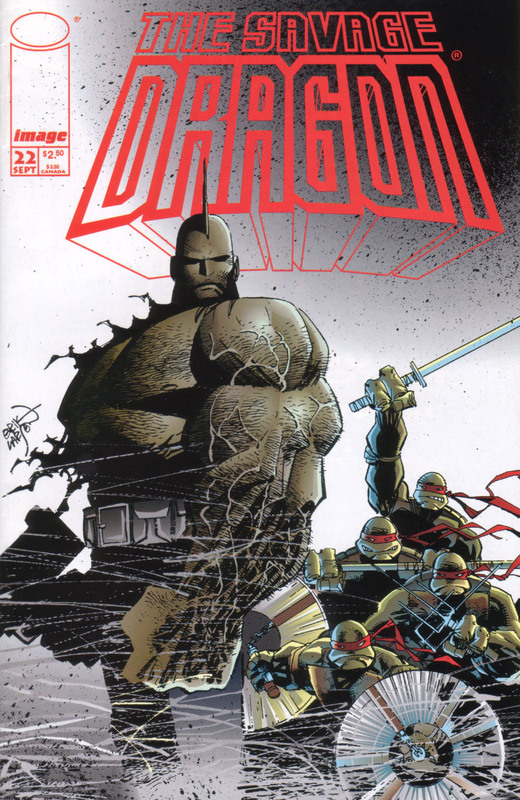 Meanwhile, Dragon and the Ninja Turtles narrowly avoid the collapse of a building as Complete Carnage launches an attack on them all. He had absorbed the force from the man-made object to increase his strength, enabling the villain to fend off the heroes. Their fight spills into the sewers before eventually reaching the edge of Lake Michigan. Dragon gets thrown out into the lake which leaves just the Turtles to take on their former opponent. Their ally swims back to shore where he is now pissed off and he lifts up Complete Carnage into the air, separating him from any man-made materials. Dragon then hurls the villain into Lake Michigan but when his foe fails to resurface, he and the Turtles wonder if Complete Carnage had survived. The Turtles are content to simply leave Complete Carnage in the lake to drown but Dragon feels guilty and leaps into the water after him. He emerges with the now deceased creature and it is assumed that he simply drowned. Dragon then drives towards Rapture’s apartment with the Turtles as his passengers. They try to cheer him up over Complete Carnage’s death by pointing out that he was a clone that had merely been regenerated from the original’s severed arm but this revelation does not succeed. After arriving at his destination, Rapture answers the door in a drenched state. Horridus had abandoned watching Guy & Duder cartoons in order to finally touch the waterbed. The water exploded out and has ruined the perfect moment that Rapture had pictured over moving in with Dragon. The Turtles depart as Rapture pleads with Dragon to stay at Frank’s home one more night. NOTE: The “Savage Dragon Vol. 6: Gang War” trade paperback collection adds a new two-page scene to this issue, showing Fiend as the one choking the Complete Carnage clone while underwater.